The Commission for Sustainable London 2012 (CSL 2012) has published its Pre-games Review (Annual Review 2011) titled ‘Breaking the tape’. In the Executive Summary, the highly respected Chair Shaun McCarthy, lists ‘awareness raising in the event of any Games-time poor air quality episodes’ as one nine important issues still to be resolved in time for the Games [page 3]. In the main section titled ‘Sustainability Review – Sustainable event’ the Report says ‘the main sustainability concern from the transport experience will be air quality’ [paragraph 7.51 on page 25]. It goes on to say ‘we have expressed concern about the degree to which public health messaging will reach tourists who may not be familiar with London’s air quality challenges on days when air quality is poor’ [paragraph 7.51 on page 25]. “This report packs a knockout punch. The most-respected independent organisation associated with the London 2012 Olympics has revealed clearly the UK’s failure to warn the public during smog episodes. Well done Shaun McCarthy and CSL 2012. “Boris and Defra* say they want to warn people about air pollution but it’s not true. The Mayor says it’s for Defra to issue press releases about smog episodes but Defra refuses to issue one because it’s always the wrong sort of pollution measured on the wrong sort of network. Even then Defra says they’ll only issue one a year. The simple fact is that the UK authorities don’t want anyone to know London has the highest levels of nitrogen dioxide, a toxic gas, of any capital city in Europe. 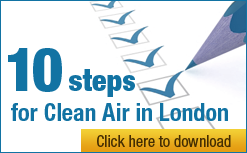 “Let’s not forget either, this issue is not about breaching legal thresholds (which are often breached) it is about the need to warn Londoners and others of smog episodes throughout the year with advice for people on protecting themselves and reducing pollution for themselves and others.